Our primary service is metal roofing. 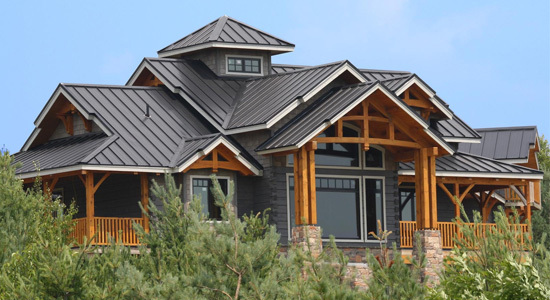 The roof system that we offer is custom standing seam metal roofs. We fabricate our own panels and custom make everything from the drip edge to the ridge cap. Our panels are 1″ or 1.5″ standing seam mechanical lock panels. We work with Drexel Metals and Englert Metals. Both companies offer a wide range of color options to match your aesthetic goals. Our metal roofs tend to have a higher upfront cost than the asphalt alternative, but you will find that in the long term you get a much better value out of this option. We have full liability insurance and offer a 5 year workmanship warranty on our installed roofs. Whether you are looking for a home makeover or are looking to repair/replace existing windows, siding or skylights, look no further. Metal Masters Custom Carpentry has the skills, knowledge and tools to install these face lift items. Often in our roof over projects we find that the siding and trim need some replacement. We are happy to include these items in our roof project estimates. We are also happy to tackle your small projects alone as well. We can install new skylights and we will custom flash existing skylights during our metal roof install.